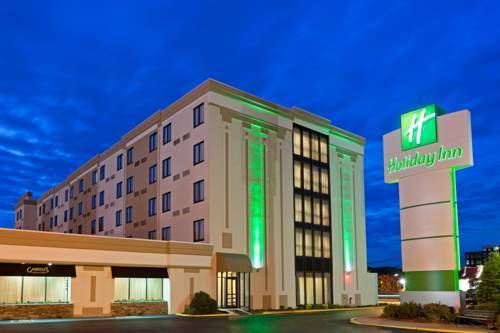 This Hasbrouck Heights Hotel Is near NYCThe bright lights of Manhattan across the Hudson River and the convenience of a NYC suburb with nearby NJ Transit options make the Holiday Inn� Hasbrouck Heights - Meadowlands hotel a great choice. You'll find everything you want in the Meadowlands area.Our hotel's guests love to take our shuttle for upscale shopping at Macy's and Neiman Marcus in the nearby Garden State Plaza Mall or to catch a movie at the AMC multiplex. At the MetLife Stadium Sports Complex, our hotel's patrons love all this sports mecca has to offer. Catch a NY Giants or a NY Jets' home game, enjoy concerts, festivals and sporting events. You can bet on the ponies at the Meadowlands Racetrack.Northern NJ and our hotel are a smart combination for business travelers. From a 24-hour Business Center, free Internet access and meeting rooms to easy access to Fortune 500 companies, local universities and Hackensack University Medical Center, we make it easy to stay productive. Traveling in the NYC and Meadowlands, NJ region? Our hotel is adjacent to Teterboro Airport (TET); Newark Liberty International Airport (EWR) is only 13 miles.Updated rooms that offer all the amenities help our Hasbrouck Heights - Meadowlands hotel exceed your expectations. Relax with friends at Bananas Comedy Club or treat a client to dinner at Gabriel's Grille & Bar. You can work out or take a dip in our pool. We look forward to serving you. The hotel lounge is open daily from noon until midnight. Ballroom is perfect for all Catering, Banquet or Meeting fuctions. Also a great size for small weddings and parties. Please call our catering professional for room availablity and details. Coming soon: The new "American Dream" Retail and Entertainment center. Located at the Meadowlands Sports Complex East Rutherford NJ. Featuring shopping, Entertainment, Movies, Indoor Skiing, Indoor Water Park and much more. Enjoy a night of family fun at Medieval Times Dinner Theater Show. Enjoy a night at the races at the Meadowlands Racetrack. Fun filled live action and simucast racing. MetLife Stadium home of the New York Giants and New York Jets. Hosting such events: Wrestlemainia 29, Bonjovi, U2, Bruce Springstein and the home of The 2014 Superbowl. Enjoy Spirit Cruises around the twililghts of Manahttan. Dinner dining, cocktails with friends, dynamic views and expection al service awaits. Enjoy the spectacular views of Manhattan from the Empire State Building. Home to the NY Kniicks and Rangers. The sports mecca host such events as NCAA Final Four, WWE, the Circus and Concerts of Elton John, Bonjovi and much more. Yankee Fans can enjoy the NEW Yankee Stadium just 30 minutes way. Easy in and out of NYC. Home of the New York Mets and many concerts events. Visit the Statue of Liberty and Ellis Island. Tours available daily. Enjoy the Areas best comedians. Dinner and room packages available.Tickets prices vary per show. Call to reserve tickets, showtimes and schedule. Radio City Music Hall home of the world famous Rocketts and the Christmas Show. Located at Teterboro Airport you can enjoy the history of flight at the Aviation Hall of Fame and Museum. ~7 miles from Hasbrouck Heights. Busts of the celebrated and the obscure -- circa 1901-1973 -- loiter along a Bronx walkway. Only 13 U.S. Presidents -- and a few presidential wannabes -- met the secret criteria to be enshrined in The Hall of Fame of Great Americans, a privately-run open-air pantheon overlooking Manhattan. ~8 miles from Hasbrouck Heights.